A member of the Alabama Public Service Commissions (PSC), the group that regulates the state’s power companies, who voted against net metering solar power recently sought an opinion from the same PSC as to whether or not a Community Solar Power plant, paying him approximately $250,000/year for 20 years on his family’s land, would be an ethics violation. After pretty much blocking solar for regular people – he pushes for $5M from solar for himself. In the United States, solar power jobs out number coal extraction jobs – and those solar jobs are growing at 20% a year. The main argument put forward to decline net metering, other than Green Little Men and Unicorns, by the Alabama PSC is that solar power owner’s have been taking advantage of non-solar users when they’re allowed to net meter. The logic is that these solar power users are not paying their fair share of the costs required to keep up the power grid. Many studies have shown this not to be the case (1, 2, 3, 4, 5, 6, 7, 8, 9, 10 – I could go on). 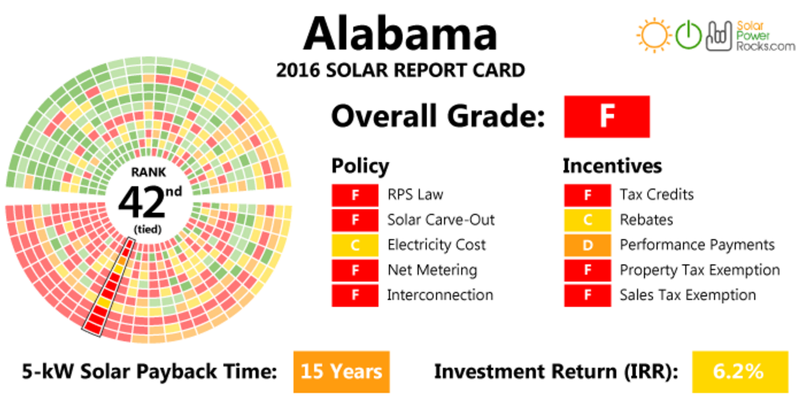 As a result of this flawed logic – Alabama Power charges residential solar customers an extra fixed fee to use solar power and pays customers much less for solar energy sold back to the grid than other utilities. The fixed fee costs customers five dollars per kilowatt based on the size of their solar array. Because residential arrays are typically between four and five kilowatts, the fee costs solar customers twenty to twenty-five dollars a month. Additionally, Alabama Power customers have to sell three to four kilowatt-hours back to the grid to offset the charge of one hour used when their systems are not producing. A solar power plant that is being built at scale, hundreds of acres, could side step the issues presented by the Commission (individuals taking advantage of the power grid) by selling energy directly to the power company, at a fixed contract rate, and taking into account the interconnection costs (hardware/powerlines to connect to the power grid) in the original contract. This logic was put forth by Warren Buffet when he pushed the State of Nevada to scrap net metering. Technically, the PSC has not said that Beeker cannot enter in the agreement with the Community Solar company, but that if Beeker signed the lease agreement, Beeker understood that he would have to abstain from any PSC decisions involving any agreement between Coronal Development Group and Alabama Power.